Whether you’re a parent looking for strategies to put a stop bullying behavior at your child’s school, or a teacher looking for lesson plans and anti-bullying activities to help teach kids about bullying and the impact their words and actions have on others, we’ve got 22 meaningful tips and ideas designed to boost a child’s self-esteem, teach empathy, and encourage kindness and respect. Bullying occurs when someone uses words or actions to intimidate someone into doing what they want. The person being bullied often feels powerless over what is happening, and the situation typically happens over and over again. We often think of of bullying as being a physical act in which someone pushes, shoves, and hurts someone else deliberately, but bullying can also be emotional. Calling someone names, spreading lies and rumors about them, making verbal threats, and sending mean comments to someone via social media are all examples of emotional bullying. This kind of intimidation often goes unnoticed as it’s easier to hide from others, but the damage can be just as bad, if not worse than traditional forms of physical bullying. It’s important to note that bullying happens well beyond school-aged children. While we may not talk about it as openly or as extensively, adult bullying can occur at home, in the workplace, and even among friends. If you’re struggling to find a way to talk to your child about bullying, this collection of ideas is sure to inspire you. Talk about it. Ask your child if he or she knows what bullying is, provide examples, and ask if he or she has ever bullied a friend or been on the receiving end of bullying behavior. Continue to look for opportunities to discuss what bullying looks like, how it impacts our feelings, and how we can put a stop to it by standing up for ourselves and others. Read books together. Books offer a great way to present new ideas and concepts to kids, and there are heaps of anti-bullying books you can read with your kids at home. And when you’re finished with them, you can send them to school so your child’s teacher can share them with the class! Not sure which anti-bullying books to consider? Here are 6 of my favorites! Be clear about expectations. Whether you’re a parent or teacher trying to teach kids about bullying, it’s important that you create – and enforce – clear guidelines around bullying. Make sure your child knows you have a zero tolerance for bullying and outline the consequences you will enforce if you catch him or her engaging in such behavior. Be a good role model. If we want our children to be respectful and empathetic, it’s important that we model these behaviors ourselves. If we are mean and unfair towards others, our children will learn to do the same. Love this Choose Kind shirt? I got it from Abercrombie Kids! Gets yours HERE and enjoy free shipping over $75! 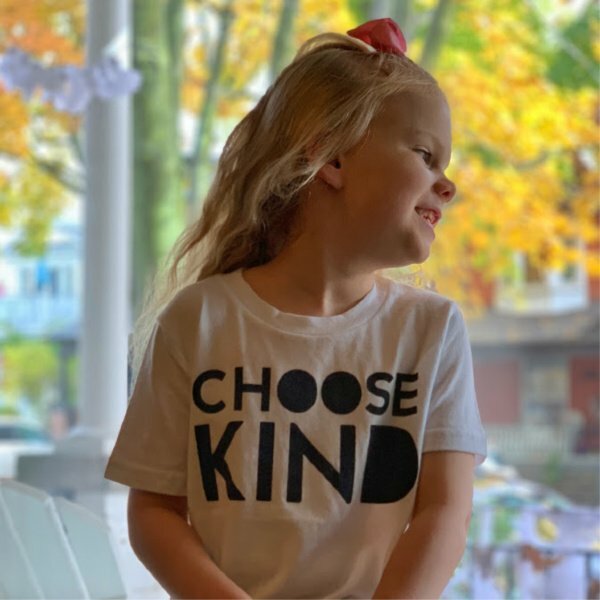 Proceeds from each Choose Kind t-shirt sale benefits PACER’s National Bullying Prevention Center. And remember, if you sign up for the A&F club, you will enjoy $10 off purchases of $50+! Teach empathy. While research suggests kids aren’t fully capable of ‘taking a walk in someone else’s shoes’ until they are about 7-years-old, a child’s experiences early in life are said to play a much bigger role in developing empathy than we think. When parents take the time to teach their kids simple emotions, model empathetic behavior, and provide positive reinforcement when their child shows compassion, they are helping to build the foundation needed to identify with the feelings of others. Take an active interest in your child’s social life. No matter how young or old your child is, make it a point to get to know his or her friends. Ask who he or she played with during recess and what games they played together after school each day, and organize playdates on weekends so you can better understand the dynamic of your child’s friendships. If you notice your child is no longer socializing with a certain friend, or appears to become uncomfortable talking about certain children in his or her class, ask creative questions to see if you can figure out the reason for the sudden shift in feelings. Don’t ignore the impact of stresses at home. As hard as we try to protect our children from anything negative that may be happening in our own lives, the reality is that they often pick-up on our stresses without us even realizing it. A child who feels worried, ignored, or insecure at home may engage in attention-seeking behaviors like bullying at school, so it’s important to pay attention to the impact of your own emotions and actions (or lack thereof). Communicate any home stresses to your child’s teacher so he or she can alert you to any behavioral changes, and don’t be afraid to seek therapeutic support for your child if needed. Is his or her clothing dishelved when he or she gets home? Have some of his or her possessions mysteriously gone missing? Does he or she seem more quiet or distant? Is he or she more anxious, stressed, or depressed than usual? Has he or she lost an interest in the things that used to bring him or her joy? Does he or she avoid social situations more than usual? If your child is displaying one or more of the behaviors above, ask him or her direct questions or use creative tactics to try to get him or her to open up about the way he or she is being treated at school. A one-on-one conversation in a safe environment may work for some kids, but others may be more willing to provide details if they are distracted with a toy or activity. Do what works best for your child and try to keep reactions to a minimum. The more emotions you show in response to the things your child is telling you, the less likely he or she will be to open up to you in the future. How Can I Stop Bullying Behavior at My Child’s School? Whether your child has told you directly that he or she is being bullied, or you sense something is amiss given some of his or her behavioral changes, don’t ignore it. A child who is repeatedly bullied will undoubtedly develop long-lasting insecurities and low self-esteem, and the feelings of stress and anxiety they develop in response to being tormented at school may make children avoid social situations and become withdrawn and depressed. Here are some ways you can stop bullying behavior before it escalates. Talk to the school. Ask your child’s teacher if he or she has noticed anything and seek advice from the school guidance counsellor, but be careful not to create a situation that will make the bullying worse. While younger bullies might stop their behavior if they are reprimanded by a teacher or other authority figure, older kids will likely torment your child even more if they catch mom and dad trying to intervene! Educate! There are so many fun anti-bullying activities for kids floating around the internet these days (see below for 9 of our favorites!) that help provide kids with the coping skills needed to speak up when they are being treated unfairly. Create an action plan. Bullying tends to be worse during recess and lunch, so work with your child and/or your child’s teachers to create a plan to help make those times easier for your child. Can he or she help out in the library or office? Does the school have a buddy system where older kids look out for those who are being bullied? Would the school consider adding additional teacher aides on the playground so nothing is missed and a bully can be caught ‘in the act’? Can your child come home for lunch? Brainstorm ideas and give them a try! The more your child sees you trying to help, the more supported he or she will feel. Give your child’s self-esteem a boost. It is extremely important that you provide a safe environment where your child can be him- or herself, and that you find ways to build up his or her self-esteem. Remind your child about his or her strengths, encourage him or her to join extracurricular activities he or she enjoys, remove your child from situations where he or she isn’t treated fairly, and model positive self-esteem yourself. Seek professional help. As much as we want to solve our children’s problems ourselves, sometimes it’s better to seek the help of a professional. Your child might feel more comfortable opening up to a therapist about some of the struggles he or she is having with his or her peers, and he or she may come away feeling more validated and in control knowing someone else is in his or her corner. Don’t be afraid to take action. If you’ve tried everything in your power to get the kids in your child’s school to stop bullying him or her without success, don’t be afraid to take action. Speak to the bully’s parents, escalate the issue to the school board, and consider moving your child to a new school. When it comes to teaching kids important lessons, I often find it helpful to incorporate a few meaningful activities into the mix to increase a child’s interest and attention while still driving the point home. I’ve noticed many teachers try to engage their students in one or several anti-bullying activities at the beginning of the school year, and hope this collection of ideas provides inspiration to keep the conversation going from September through June! When it comes to anti-bullying activities, this is one of my favorites. It’s so easy to recreate – all you need is a tube of toothpaste, toothpicks, and a paper plate – but the lesson it teaches is very powerful. Have the kids in your class squeeze all of the toothpaste out of a tube of toothpaste onto a plate, and when they are done, ask them to put the toothpaste back into the tube using toothpicks. It won’t be long until they realize the task is impossible, at which time you can engage them in a discussion about bullying. Ask each child to provide an example of a time when someone said something mean to them and write the hurtful words they share on the blackboard. Once everyone has had a turn, ask the students to imagine the toothpaste represents all of the words you’ve just written down, and help them understand that, just like you cannot put toothpaste back into a tube, you cannot remove the pain caused by saying hurtful things to others. Amazon sells 28-piece blank puzzles, which can be used to create fun and meaningful anti-bullying activities for kids! You can do this in so many ways, but my suggestion would be to give every student in your classroom a puzzle piece to write their name on and decorate with markers and other art supplies, and then have the entire classroom come together to assemble the puzzle. The idea is to show each student how unique their puzzle piece is, but that they all fit together despite their differences. Consider gluing the pieces together and displaying it on a bulletin board as a reminder to the kids in your class that they are an important part of the group! Another one of my favorite anti-bullying activities it to ask the students in your classroom to take a ‘pledge’ to stand up to bullying. This could be a week-long lesson in which you read various books about bullying (see above for my favorite recommendations! ), discuss situations in which you’ve experienced bullying (or bullied someone) yourself, and discuss effective ways to stop bullying behavior. At the end of the week, have each child sign an ‘anti-bulling contract’, or provide them with something symbolic (a cutout of a hand, a flower, etc.) to decorate with their name printed inside so you can create a meaningful display to remind each child of the promise they made to watch out for themselves and others. Teachers often incorporate random acts of kindness into their Thanksgiving activities, but they also double as fabulous anti-bullying activities as well! There are heaps of different ways you can encourage kindness within a classroom setting, and one of my favorites is to provide each student with a super secret kindness mission. Depending on the age of the children in your classroom, you can provide a written mission to each student (‘Your secret mission is to tell John 3 things that are AWESOME about him today!’), or you can engage with them each individually to brainstorm ideas together (‘I notice Suzie always eats alone at lunch and I’d like for you to find a way to help her feel included.’). Teachers are often privy to the ins and outs of friendships within a classroom setting, and can structure this activity strategically so that the kids who are prone to engaging in bullying behavior are challenged to find ways to show kindness to a child they may otherwise overlook, while also finding ways to draw timid and shy kids out of their shells and make connections with their peers. Another great way to encourage kindness in the classroom is to start a ‘kindness chain’. Explain what kindness means, provide examples of ways your students can show kindness to their classmates, and challenge them to find ways to incorporate kindness into their daily routine. Each time you catch a student doing something kind, ask them to write it on a piece of construction paper with their name and add it to your ‘kindness chain’. You’ll be amazed at how excited your students become over finding ways to be included in this fun activity! At the end of grade 1, my daughter brought home a small paper plate with a popsicle stick glued to it with a bunch of words printed all over it. Intrigued, I sat her down and asked her to explain what it was. She told me that at the beginning of the school year, her teacher asked everyone to create ‘paper plate flowers’ with their name printed in the middle of the plate. For the remainder of the day, they carried their flower with them to all of their activities and asked their peers to write one nice word to describe them. The plates were then displayed on a wall so each child could remember the good qualities about themselves and their friends. While searching on Pinterest for anti-bullying activities for kids, I found this Compliment Circles Activity and I really love it. It’s similar to the idea above in that each child receives a compliment from each of their classmates, and also provides a compliment in return, but I love that this is more of a group discussion as you can do so much with it! CLICK HERE to learn how you can recreate this in your own classroom. Another fabulous activity my daughter’s class engaged in last year was called ‘Friendship Fridays’ and I loved it. The idea was to set aside an hour for ‘open play’ every Friday afternoon, but it came with a few strings attached. The kids weren’t allowed to play with their BFFs, but instead had to branch out and socialize with the other kids in their class, and they were encouraged to spend time with the students in other classrooms as well. Since her school is relatively small, they opened up all of the classrooms from kindergarten through grade 6, and it was a wonderful time in which the kids read books, played games, and just got to know other children they may not otherwise spend time with. While I was looking for anti-bullying activities for older kids, I stumbled upon this gem by ‘YourKids’ Teacher and it made me teary-eyed. If you’re a teacher of kids in the 12-16 age range, this is a great class lesson to consider! Randi Weingarten once said, ‘You can’t be against bullying without actually doing something about it’, and I hope this collection of teaching tips and anti-bullying activities inspires you to find fun and creative ways to ensure the children in your life are not only kind and respectful towards others, but that they feel confident enough in their own skin to speak up and put an end to bullying when it happens to them or someone they love. 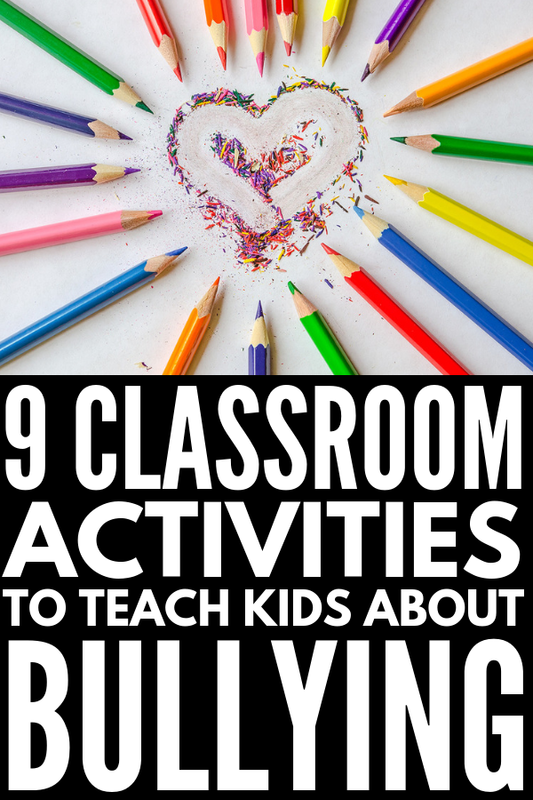 If you found this collection of teaching tips and anti-bullying activities helpful, please share this post on Pinterest!